Thanks for the nice comments on my previous post! I've used my new bag every single day now and love it! The gold triangles definitely amplify the first sun rays!! As promised, I wrote down the entire process - for me, so I won't repeat my mistakes and for you, so you can give this a try, since really, as scary as it may seem, leather actually is a very nice material to work with. 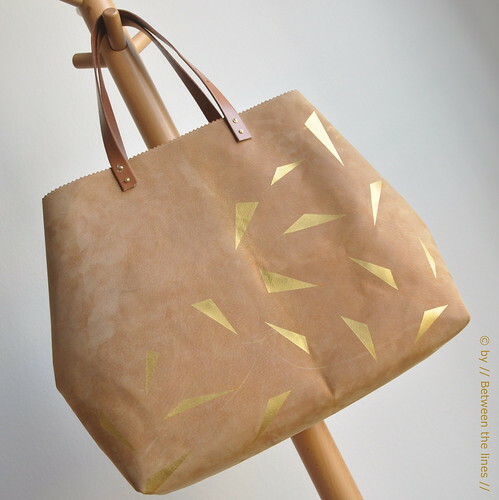 In this DIY, you will find some general information, instructions on how to paint on leather (illustrated with pictures) and step-by-step (written) instructions for putting the bag together. I included the bag pattern as well. 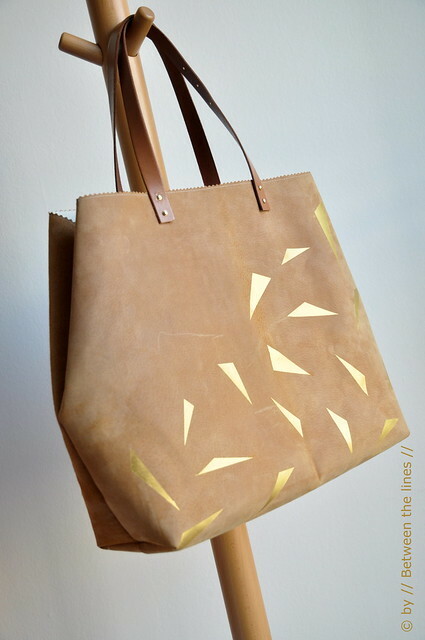 Leather and gold bag :: the DIY instructions. Before starting to paint on your precious leather skin, try a couple of samples first on a piece of scrap. This in order to see how well the paint works on the leather color wise as well as to determine the number of layers needed for a perfect coverage. Also, I tested several methods, from painters tape, washi tape, to Freezer Paper to set out the template on the skin and found freezer paper to work best. Both types of tape left marks on the leather and are more difficult to work with when you intend to repeat a certain pattern or have large surfaces to cover. Before you start sewing the leather, again, try on a piece of scrap first, this to determine the correct tension and stitch length (avoid small stitches as this might result in ripped leather) and to get the right feel for sewing leather. Depending on your machine, you might notice you need to 'guide' the leather more than is the case with fabric as it doesn't slip that easily. The use of a special machine needle for leather is highly recommended. Except for a leather sewing machine needle, a rotary hole punch and rivet setting tool, no special tools are required which makes this project really accessible. 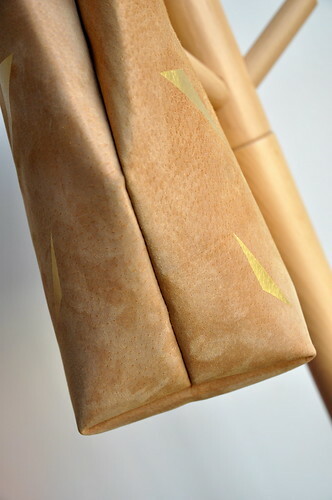 - optional: fabric for the lining - I used untreated muslin. Transfer your design onto the freezer paper - if you intend to repeat the pattern on both sides of the bag, fold your freeze paper in two in order to make two templates in one go. With an Exacto knife cut out your design making sure to cut through both layers when making two templates. Position your template on your leather. 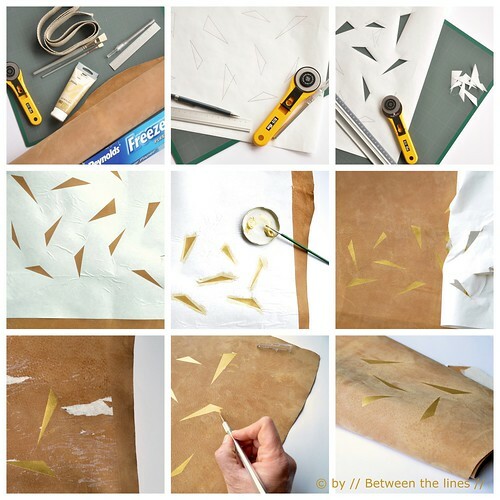 Iron the freezer paper onto the leather (test on a piece of scrap first), with special attention for the edges of the cut outs - you do not want the paint to seep under the freezer paper. You can skip the in between areas. Note: make sure to iron without vapor! Before starting to paint, check the edges once more - it will save you from a lot of trouble later. Paint the cut out areas - let dry in between layers and repeat if necessary. I did 3 layers. Let sit until dry to the touch and then gently start peeling off the freezer paper. If there happens to be some freezer paper residue, cover the area with a piece of paper towel, heat with an iron and then gently (!) scratch the remains with an Exacto knife. Use the bone folder to 'polish'. If some paint did seep under the freezer paper, gently(!) scratch the excess paint with an Exacto knife. 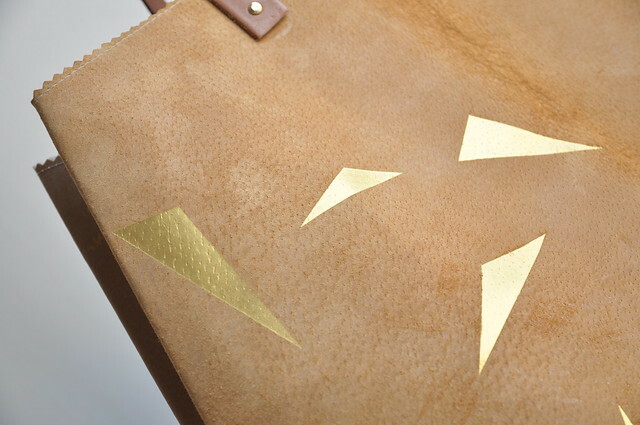 Place the above template onto the (back of the) leather. Check and check once more, reposition if needed and then trace with a pencil or marker. Cut out with a rotary cutter. 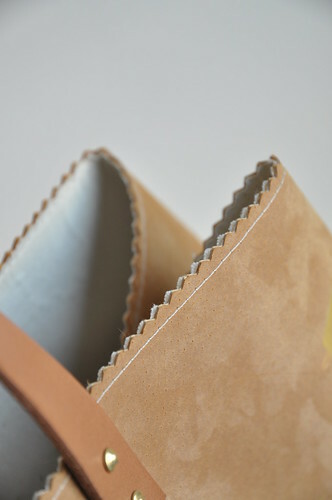 Note: Seam allowances (1cm) are included unless stated otherwise. I made my bag in one piece so at the bottom there's a fold and not a seam. 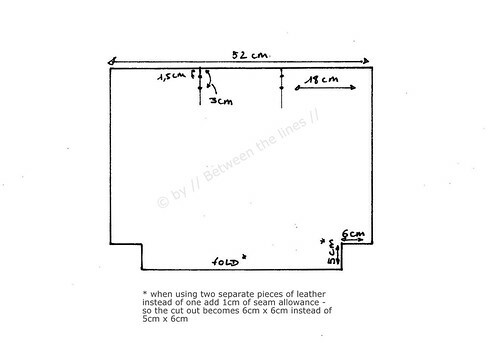 This implies that the cut out for the boxed corner measures 5cm x 6cm. In case you work with a bottom seam add a 1cm seam allowance (hence the cut out becomes 6cm x 6cm). Since leather skins often have stamps or writing on the back and since I wanted to have a small pocket on the inside as well, I decided to line my leather and to do so before the sewing. I'm not sure this was the best method as the fabric came loose at a couple of spots. Much depends on the quality and weight of the Vliesofix used, I guess. Again, test on a piece of scrap first if your fabric will adhere to the leather or not. Iron the Vliesofix onto the muslin ( not cut to size yet!). 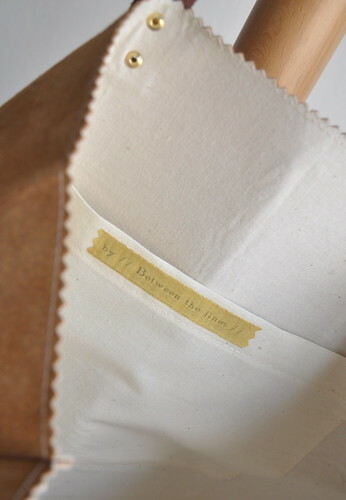 Next, place the muslin with the Vliesofix facing down onto the back of the leather. Peeling off the paper backing as you go, iron the muslin onto the leather, making sure there are no air pockets or wrinkles. Now cut the muslin to size. Sew the side seams together, right sides (leather) facing. Note: one advantage of lining the leather is that since fabric is on the 'outside' while stitching, the layers will move under the presser foot with more easy. Trim away excess with pinking shears - you can also apply a tiny bit of glue onto the leather over the entire seam length. Trim away excess seam allowance and apply a tiny bit of glue in between layers. Cut the belt to size to make two same length straps. Make two holes on either end of both straps, corresponding to the size of the rivets used (check the instructions which came with the rivets - here's a good tutorial for setting rivets (I wish I would have looked at this prior to making the bag)). Determine where you want the straps to come on the bag and mark the holes for the rivets using the holes already made in the straps, as a guide. Punch holes. Finally, punch rivets through both layers (strap and bag). 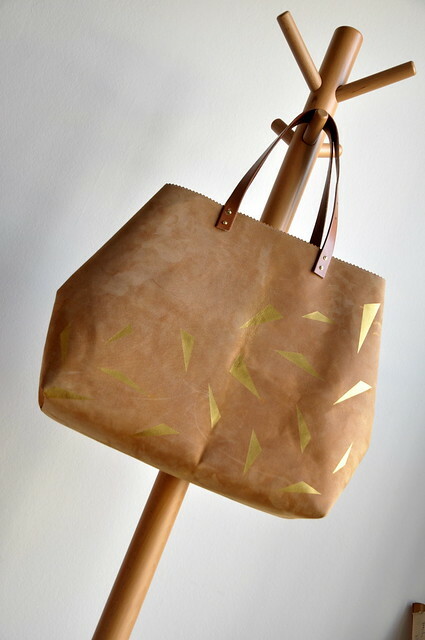 Et voilà, un beau sac!! As with all of my tutorials, please note, this tutorial is intended for personal use only. Therefore, do not reproduce, sell or commercialize in any form without permission. Thanks for understanding!